Oregon’s largest state park, Silver Falls, is 24 miles east of Salem and boasts the beautiful Canyon Trail/Trail of Ten Falls. 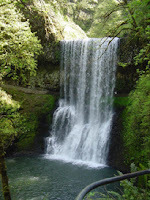 This connected series of trails covers 22 miles, with multiple short sections leading to footbridges, fern-and-pine shaded waterfalls, and pools. One of the most popular and easily accessible is South Falls, which drops 177 feet; you can even walk behind the cascade. Middle North Falls is considered the most picturesque. The Civilian Conservation Corps hand built the picnic shelters, a main lodge, and other structures now on the National Historic Register. In addition to the Canyon Trail, there are about 25 miles of pet-friendly trails that lace through this magnificent park. The 131-site campground has 52 RV sites (maximum 60 feet) with electricity. For reservations, call (800) 452-5687. “The Biggest Little Circus in the World” comes to town in August and September to celebrate 60 years of performances. 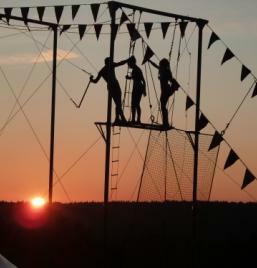 Thousand Trails’ Chehalis and Mount Vernon campgrounds are proud to host the troupe performances for two weekends this year. Once you reach the end of the road, which at this point is a series of narrow hairpin turns, park your vehicle (your tow-vehicle or smaller RV only), grab your fleece jacket and wander up the trail a bit. You don’t have to go far before you’re rewarded with some of the most breathtaking mountain views in the entire U.S. West. Mt. Shuksan, Mt. Baker, and a dozen or more snow-capped Cascade peaks make you feel as if you’re on the roof of the world! Bruneau Dunes State Park encompasses a 470-foot-high sand dune, a serene lake, prairie terrain, and marshland. It’s a stunning slice of sagebrush desert, quiet (non-motorized dune vehicles and boats only), and a favorite park for stargazers. Because of its fine warm weather, it also offers one of the longest camping seasons in the state – usually from March through October. At the edge of the small lake sits Idaho’s largest public astronomical observatory. Every Friday and Saturday evening park visitors are welcome to enjoy an orientation program, followed by a look at the heavens through one of the telescopes. In the clear, balmy evening air, it’s a memorable experience for all ages. • Bruneau Dunes State Park is located 18 miles southwest of Mountain Home. • Park day-use fees (non-campers): $5 per vehicle. 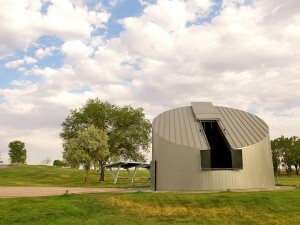 • The observatory is open Friday and Saturday evenings through October 13th. The viewing fee is $3 (under 6 free). Head over to Crystal Mountain and experience another side of Mt. Rainier this summer. In winter it’s a skiers paradise, but now, during these long days of summer, the slopes are covered in wildflowers and often visited by deer. For RVers, Crystal Mountain’s “B” Lot offers 40 sites with electrical hookups ($30, first-come, first-served) and many more without ($20). Evergreen forest, lakes, and mountain creeks make for a classic Northwest camping experience. Take the Mt. 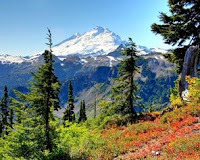 Rainier Gondola (wheelchair accessible) to the summit; the 360-views are spectacular. 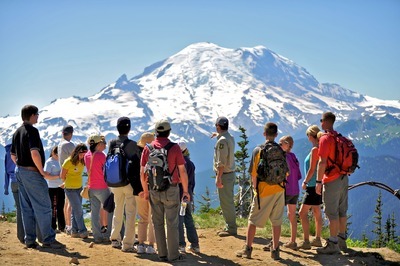 At the top, you can hike the alpine trails, enjoy an interpretive ranger talk, or simply ogle the vistas from the platform. For a real treat, have lunch or dinner at the Summit House – at 6,872 feet, it’s the highest restaurant in Washington! Point No Point lighthouse changes hands. Lighthouse lovers in the Northwest here's a flash: The Point No Point lighthouse on Puget Sound has been formally transferred to Kitsap County government, and off the federal books. Under the agreement, the county has guarantees to both preserve the light station and to continue to make it available for public use. The Point No Point Light Station is the oldest lighthouse on Puget Sound, and several of its original buildings are still intact. It features a square light tower, fog signal building, oil house and nearby keeper’s quarters. 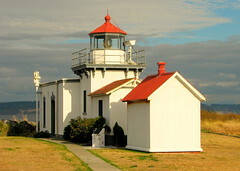 With strong interest in the light station, Kitsap County formed a partnership with the United States Lighthouse Society to maintain and interpret the site. The light station was recently rehabilitated with a grant from the National Trust for Historic Preservation and American Express. The station has been on the National Register of Historic Places since. 1978. That's far less time than the lighthouse has been up and running--that rolls back to its completion in 1879. Since the station is no longer needed as an aid to navigation, visitors can rent out the keeper's cottage and spend their time prowling the beach or catching up on the views. They might find themselves having to share the property with other guests, including bald eagles, seals, and other bird life. A crew from Ballard Diving and Salvage of Vancouver, Wash., will begin removing the derelict dock at Oregon's Agate Beach starting the morning of Tuesday, July 31. The beach near Newport will remain open during the work except for a closed safety zone around the dock demolition site. The project will take three to seven days to complete. The 66 by 19 foot dock washed ashore June 5 and is believed to weigh 130-165 tons. It originated from the Japanese port city of Misawa and was carried out to sea during the March 2011 tsunami. Ballard was awarded a contract for $84,155 to complete the work. The company plans to cut the dock into several large pieces, place them on a heavy-haul truck at the main Agate Beach access road and transport them to a Portland-area facility for final demolition and recycling. Portions of the beach may be temporarily closed during the removal. Residents and visitors can expect congestion in and around Agate Beach State Park, Highway 101 and NW Oceanview Drive, during the project. The main Agate Beach parking lot will be open, but the smaller, roadside parking area will be closed for the duration of the work starting Monday, July 30. The Oregon Parks and Recreation Department is responsible for maintaining the beach in as natural a state as possible. When boats and structures wash ashore -- and they do every year -- they are removed. Park staff and thousands of volunteers also put in tens of thousands of hours of effort to remove smaller pieces of debris to preserve Oregon's beautiful beaches. Individuals or groups interested in volunteering for future beach cleanups can visit http://bit.ly/MvxUI4. A list of upcoming beach cleanups (and other events) is online at http://solv.org/get-involved/volunteer-event. Rows and rows of fragrant purple haze draw visitors to the most popular Lavender Fair in the U.S. Situated in the rain shadow of the Olympic Mountains, Sequim, Washington has just the right blend of sun and soil to produce hundreds of acres of this multi-use flowering plant (more than 200,000 plants!). 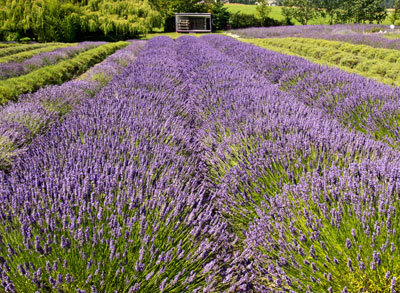 The area is nicknamed “America’s Provence,” after the famous lavender region in the south of France. During the festival weekend, which runs from Friday, July 20 through Sunday, July 22, you can tour the seven lavender fields on the Heritage Lavender Farm Tour, each with its own unique setting and backdrop. There are workshops and demonstrations and you can photograph, pick, and purchase fresh or dried bouquets, along with an amazing array of products, from fine soaps to oils and culinary flower buds. The Carrie Blake Park is festival central and where you’ll find more than 100 lavender-related booths; a wide variety of food from area restaurants (including crab, salmon, BBQ); a wine and beer garden showcasing local brews and vintages, including lavender wine; music by the 133rd Army Band; and lots of fun activities. For dessert? Why lavender ice cream, of course! Logistics: There is plenty of parking at the individual farms (even for RVs), but the easiest way to enjoy the events and farm tours is to park at Carrie Blake Park and hop on a Farm Tour Shuttle Bus. The Heritage Farm Tour pass is $15, which includes the shuttle (children under 12 are free). There is no admission charge to the festivities in the park. Ah, sweet, ripe summertime! The Northwest is mighty generous in its bounty of fresh produce and fruit and those of us lucky to be rambling around the scenic countryside in our RVs can easily stop to pick our own, or buy local from one of the many farms we drive by. Wild horses charge across a ridge high above the Columbia River in central Washington – a dramatic sculpture that has caught the eye of travelers heading along I-90 for the past 25 years. The 200-foot-line of weathered metal stands in silhouette against the sapphire skies of this inland region, reminding us that wild horses once roamed the area. Commissioned for Washington State’s Centennial in 1989, artist David Govedare, from Chewelah, Washington, titled his creation “Grandfather Cuts Loose the Ponies” in honor of the legend of the Great Spirit who released the wild horses into this stark, sage-scented landscape above the Columbia’s Wanapum Lake. A quarter-mile exit (eastbound) leads to a plaque and a great vantage point for photos, as well as excellent hiking trails and sweeping views of the mighty Columbia below. If you’re heading west, it’s a 10-mile loop to turn around at the east end of the Vantage Bridge. CAMPING: We highly recommend Gingko Petrified Forest State Park, a fascinating fossil-discovery area with fantastic views. There are 50 utility sites with full hook-ups and a dump station. For reservations between May 15 and September 15, call 888-226-7688. From southern Oregon to central Idaho, and running the length of Washington State, volcanoes have played an active role in shaping the landscapes of the Pacific Northwest. They give us incredible geological formations to explore and nourish the soil to promote the lush growth that creates our beautiful environment. There’s something both magical and mysterious, too, about camping in the shadow of a “living” volcano. The night skies seem close enough to touch, the sight of an open crater gives us a chance to feel the power of awe, and the determination of nature to return after a cataclysmic eruption such as Mt. Saint Helen’s puts things in a more balanced perspective. Lava Flow campground is nestled behind a cinder cone. 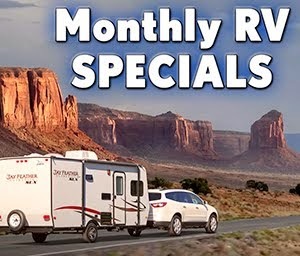 Of the 51 sites, there are a few good sites for larger RVs on a first-come, first-served basis. No hookups. Lewis & Clark Campground is s special 600-acre area – one of Washington’s last remaining old growth forests. The nine utility sites (60-foot maximum length site) are available only a first-come, first-served basis. White River Campground, at the grand dame of Northwest Volcanoes, sits in the somewhat less-visited northeast corner of the park near the stunning meadows of Sunrise. It’s also at 4,200 feet, which means an alpine feel and even the chance to spot mountain goats. There are restrooms, but no power and no showers (at any Mt. Rainier campgrounds). RV length max is 32 feet. Reservations: 877-444-6777. 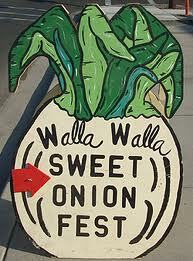 Come celebrate the delicious, nutritious – and very fun to say – Walla Walla sweet onion at the annual festival on July 14-15. Try your hand at onion bowling. Sink your teeth into a caramel-covered onion. Vote on your favorite onion soup, or help the judges decide which onion salsa takes the prize. And, on Saturday evening, dance the night away in the town streets to the tunes of three great bands. The name Walla Walla derives from the Indian language and means “many waters.” The fertile region was home to Cayuse and Walla Walla tribes, and the Nez Perce Indian trail ran through what is now the center of town. In the early 1800s fur traders settled the area and, with the discovery of gold in the 1860s, the town sprouted quickly. The sweet onion arrived here in the late 1800s, brought by a French soldier who discovered the sweet tasting root vegetable on the island of Corsica. Since then, the local farmers have carefully cultivated this big, round, sweet onion, a beloved ingredient in regional Northwest cuisine – and clearly worthy of its very own festival. There are numerous private RV parks in the area (check out http://www.wallawalla.org/rv_parks.cfm), or you can enjoy the scenic beauty of the Umatilla Valley and Umatilla National Forest, which encompasses 30 parks, including the Lewis & Clark Trail State Park.